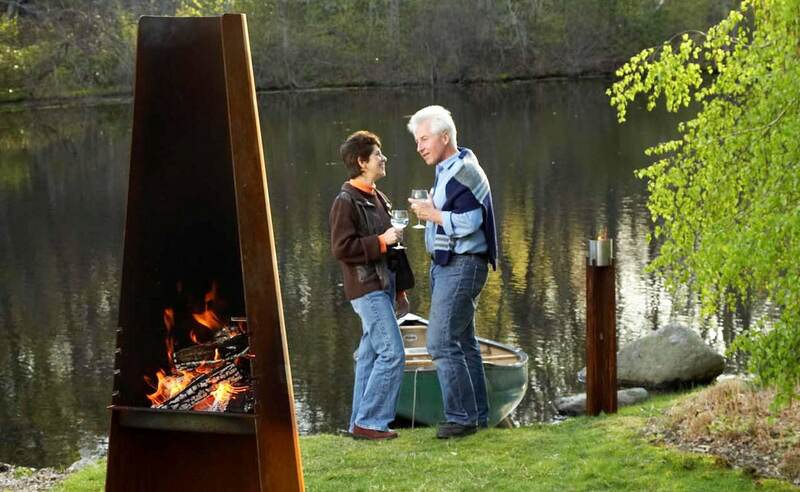 The Phoenix and Firebird grills, created by award winning Danish architectural designer Bent Falk, are intended to be used as outdoor fireplaces and barbeque grills, or simply enjoyed as outdoor sculpture. 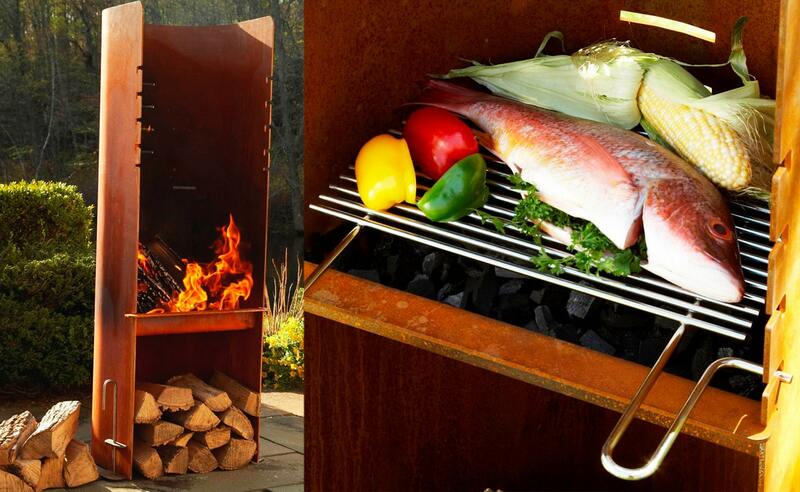 The Phoenix Grill is the winner of the 2008 Platinum ADEX Award for design and innovation. Both are made of cor-ten steel, well known for its durability. They come un-oxidized but will naturally form a rich reddish brown coating that makes each grill unique. This protects the inner steel and makes them virtually maintenance free for years and years to come. Both grills have adjustable racks that are made of heavy, solid stainless steel 5mm rods. The innovative design features stay-cool handles, and the Firebird even has a built-in warming and frying surface in back where you can simmer sauces or sauté vegetables. 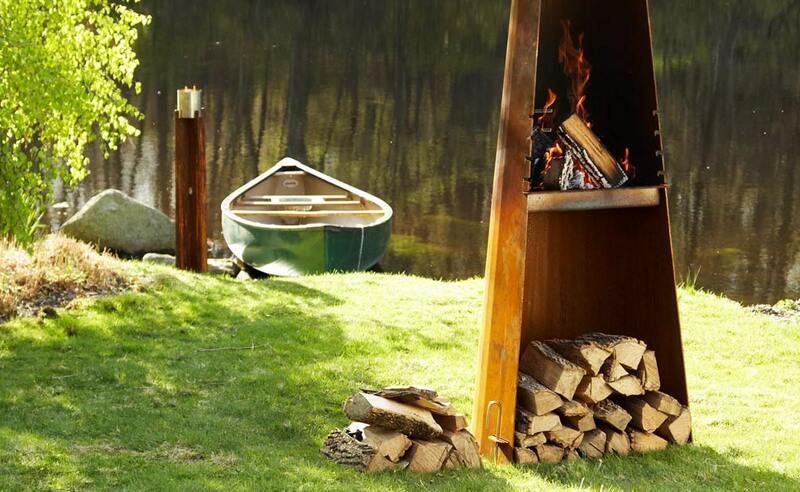 The chimneys create a strong draft that allows you to build faster fires. Then they “funnel” the smoke up and away from the chef – and nearby guests. Both Phoenix and Firebird come with removable stakes to secure them on a lawn or at a beachfront location. And when winter rolls around, light up a roaring wood fire as a warm gathering place après skiing, skating, or sledding. The Phoenix measures 6’2” h x 24”w x 20”d and weighs 220 lbs. and the Firebird measures 4’3” h x 19”w x 19”d and weighs 160 lbs. Made in the USA.